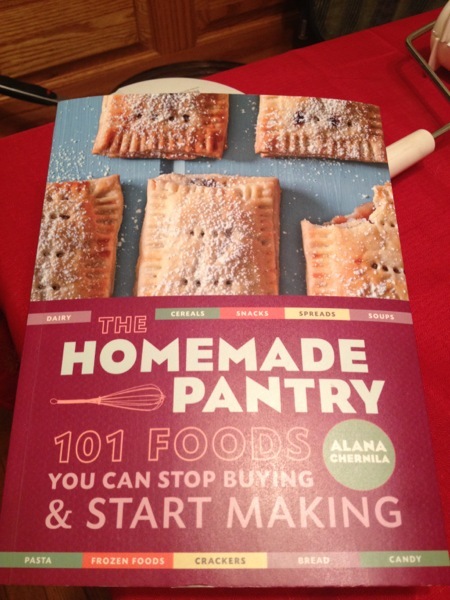 I got a great book for Xmas from my Secret Santa coworker called The Homemade Pantry, 101 Foods You Can Stop Buying & Start Making by Alana Chernila. I admit, I requested it. We used the website www.elfster.com that selected our "Secret Santa" anonymously and allowed us to create wish lists, so after seeing another coworker request it, I totally cheated and stole the idea. Ironically, we both received a copy of the book. In a tribute to Julia Powell, author of Julie and Julia: 365 Days, 524 Recipes, 1 Tiny Apartment Kitchen (2005) and the inspiration for the film Julie and Julia, I have decided to spend a good chunk of the next 101 Sundays to making something from scratch and blogging about it. My husband of course thinks I'm a lunatic but I think he secretly is excited for the prospect of homemade ricotta cheese and other goodies this book seems to promise. I've already read it from cover to cover and I'll be honest, I'm excited as hell to get started albeit nervous about sauerkraut which I have all the ingredients for right now but has to ferment on my countertop for up to 10 days! Fear and fermenting aside, the author does have some things in her book that I already do regularly and I'm curious to see how her recipes stack up next to mine. So now my NYC kitchen is ready for the challenge and every Sunday I promise to create, experiment and hopefully, successfully re-create each of these recipes for your reading and viewing pleasure. I'm sure there will be some mishaps and I'm sure there will be some triumphs but over all there should be a better understanding of how to control what you consume by making everyday things that you would normally buy.